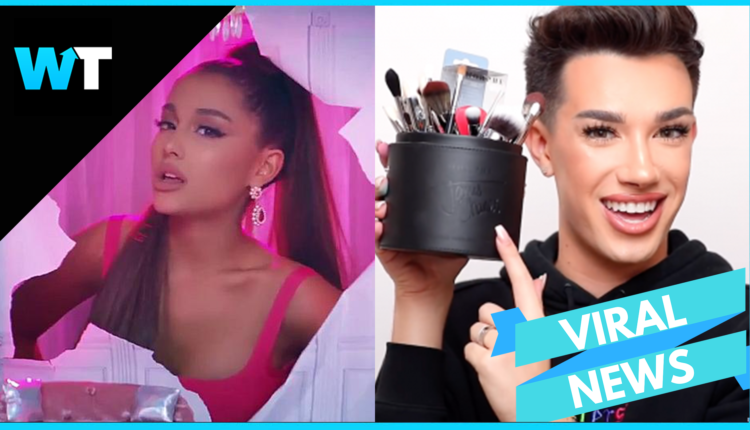 VIDEO: James Charles TEASES Ariana Grande COLLAB?! James Charles is proposing a collab video with old frenemy Ariana Grande. Can they bury the hatchet? James Charles is proposing a collab video with old frenemy Ariana Grande. James Charles is a beauty blogger and makeup entrepreneur who counts over 14M subscribers on his YouTube channel and made history as Covergirls’ first male spokesperson. He additionally caused a media firestorm with his Morphe palette tour. At just 19 years old, James has accomplished a lot in his life…but it hasn’t been without some drama. On a trip to Africa, James once joked about possibly contracting ebola, making a lot of people mad, including celebrities. In a makeup tutorial with Shane Dawson and Ryland Adams, James revealed one celeb who was particularly upset over this tweet: Ariana Grande. James details going to Ariana’s show while all of the drama over his Ebola tweet was blowing up, saying she DM’d him, and unfollowed him. James messaged Ariana about it to see what was going on, and says that she expressed that she didn’t want to dissapoint her fans. James goes on to express how he thinks she should have handled this situation. But now James is working hard to nip any drama in the bud. Since then, James’ channel has grown immensely, going from around 2M at the start of 2018 to now over 14M. He recently explained to the UK media, which was baffled at how many fans turned up for his Morphe meet and greet, exactly why he thinks his fans resonate with him, citing relatability. And fans agreed, leaving comment after comment with high hopes this collab will happen. Ariana, who has her own album coming out featuring already record breaking songs, has not publicly responded to James’s pitch, though she is heavily promoting her album release on social media, interacting with fans, and rejoicing in her recent successes. What do you think? Do you think Ari and James will be able to leave the past behind? Let us know in the comments or on Twitter at @WhatsTrending.